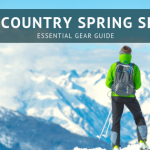 Spring is in the air and camping season is around the corner so we wanted to take a look at some of the newest tents from one of our favorite outdoor brands, Nemo. The new line of 2011 Nemo tents are in, and we spent some time with two exciting shelters, the Nemo Obi 2 and Nemo Meta 2. Next up is the Nemo Obi 2, an incredible tent that has all the luxuries of a double-wall tent (and a few more) in an ultralight, freestanding package. For 3 pounds (1.4 kg), you get 27 square feet of interior space and two doors and vestibules with an additional 18 square feet of storage space. Throw in thoughtful details like a Gear Caddy (a plethora of pockets for all your gear) with Light Pockets that diffuse a headlamp dropped in for interior lighting, the first recyclable DAC Featherlite Poles, and Jake’s Foot pole ends that make set up and take down a snap, and you’ve got a great camping companion. Go to our Nemo Obi 2 product page for more information and a video with set up, details and more. The Nemo Asashi is an incredible tent! It is extremely easy to assemble with tons of common sense engineering throughout. My first setup was done in the thick of the night at about 10:30pm without any problems. Total set-up time first time was maybe 20 minutes. There after I can have it set up in close to 10 minutes. Inside are pockets along the base as well as in the ceiling for smaller items. The floor rises a few inches on all four sides to provide a better, more durable moisture barrier. I am not a hard-core backpacker or camper. When I camp, I like to maintain a few basic luxuries. One of those is space. I would have a very difficult time categorizing this as a four man tent. Yes, it could accommodate four, but it would be very tight. I prefer to use it as a two to three man tent with some space inside for personal items stored along the outer edges. The front door of the rain fly is bittersweet. The design will do an excellent job of keeping rain and moisture out, but is very tight to walk/crawl through. 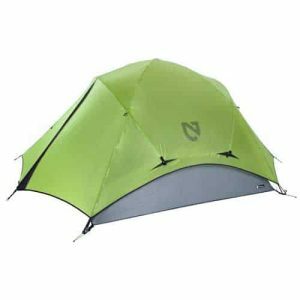 I would not recommend this tent to backpackers because of the weight. However, if you are like me, and you drive most of the way with fairly short walks to your desired campsite, it would be excellent because it stores quite compact for a tent this size. Overall quality is excellent. On a scale of 1 to 5, I gave this tent a 4. As noted previously, the only thing preventing it from getting a 5 is the ingress/egress with the rain fly in place. Looks like Nemo has broken new ground with the Morpho AR 3-season tent. With the Morpho AR, they’ve done away with a central aspect of traditional tents, eschewing traditional tentpoles for “airbeams,” an inflatable, highly durable alternative. A feat of design, the Morpho AR is lightweight, roomie, and amazingly easy to set up. Forty feet of floor space is kept completely rain-free (no matter how hard the downpour) as well as condensation-free with efficient venting. At 4.8 pounds, you might wonder if you forgot to pack it. The set-up was quick and easy; the first time I set it up, I had the thing up in about two minutes. And as proof that the people at Nemo use their product, they’ve added one of the best features I’ve ever seen in a tent: the ability to set it up from the inside. The airbeams can be inflated from inside the tent, and as a guy who’s set up his share of tents in miserable weather, I can’t say enough about how great this is. Details like that as well as other, smaller details like the Lightpocket (which distributes light from a headlamp evenly throughout the tent) show that Nemo isn’t just about wild innovation – they do the little things right as well. I’d heard a lot about the Morpho AR before I tested it, but I was still skeptical about the airbeams. I mean, how sturdy could an inflatable tent be? Very sturdy, apparently. Once inflated, the airbeams are extremely rigid-they feel a lot more secure than any tentpoles I’ve slept under. And if you’re worried about how well it performs in windy conditions, Nemo’s got you covered: they strapped a Morpho AR to the roof of a car and took it for a ride. I have been living in this tent for about a month now in the Tahoe wilderness, and it is definitely the nicest tent I have ever used. Actually it is probably the coolest tent I have ever seen. 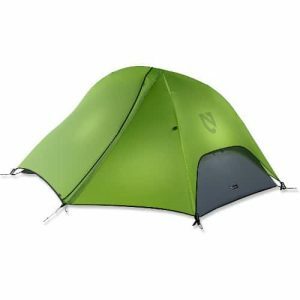 Weighing in just under five pounds the Morpho 2P packs more innovative features per ounce than any other two person tent out there. Its no wonder, New England Mountain Equipment was started by a couple of MIT engineering graduates. I’ll begin with the setup. This tent is not free-standing, it needs to be staked out to stand upright. The small J-Stakes hold amazingly well considering how small and light they are. Once staked out the AirBeams are inflated using the Nemoid foot pump, either from the outside via small access zippers next to the beams or from the inside if you are caught out in the rain. Once the tent is pitched, the customizable ExoFly entry gives you several options depending on weather and insect conditions. If you need to cook during a downpour, you can unclip the tent interior from the ExoFly, giving you a 14 square foot vestibule. You can also use some trekking poles or some sticks and prop the center panel out for additional vestibule space. The ExoFly also provides multiple entries, allowing you to enter through any of three small doors at the front of the tent, or unzip the center and right door together to open the whole thing up. The no-see-um mesh on the vestibule is more breathable than most tents, and the black color is great for gazing at the stars on clear nights. 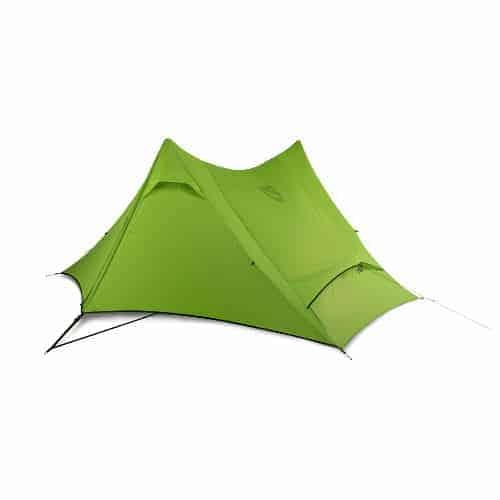 I am also really impressed with the OSMO fabric, which is new to Nemo’s 2010 single wall tents. OSMO is a 40D polyester ripstop fabric with hydrophobic microporous polyurethane coating. It is highly breathable, and has never gotten dewy on even the coldest nights. OSMO is also lightweight, UV-resistant, highly durable, chemical-resistant, and abrasion-resistant, and doesn’t sag when wet. The white interior side of the fabric helps illuminate the tent when I place my headlamp in the specially-designed light pocket above the door. 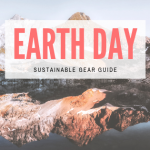 Other great features include: Hypalon reinforcements at stress points, UV-resistant UVX window, Bemis waterproof thermoplastic taped seams, and adjustable vents throughout the tent. I also got the optional footprint and pawprint, which are both very nice upgrades and help extend the life of the tent. Long story short, this tent totally rocks and I highly recommend it to anybody in the market for a two person tent, three season tent. I bought this tent back in June in anticipation of a climbing trip out to Colorado. Since then, I have used it for everything from pitching outside of a car to 20-mile backpacking trips. The rain this summer has been insane, but the Nemo held up better than I could have imagined. I purchased this tent after reading great reviews about Nemo design and durability and I was not disappointed. I opted for the 3 person Losi instead of the two person for the extra size, since I am 6’1″ tall, and wanted the extra space inside in case of foul weather. Another big selling point was the optional pawprint, which is a pad for the inside of the tent that is machine washable and protects the tent floor from dog toenails — a big plus for me since I travel with two dogs.I set up the tent at home for a trial run in about 30 minutes, the instructions are very basic, and they are attached to the storage bag so you cannot lose them. There is no ‘materials list’ included so I was confused about what a few things included in the package were, but a quick call to Nemo’s 800 number answered those questions — and believe it or not when I called a dude answered, he was based in the U.S.A., and he was able to answer my questions with no transfers and no automated number pressing — very uncommon these days and very cool. The questions I had were: 1) there are velcro straps attached to the underside of the fly that look like they are supposed to be connected to the tent poles, Nemo explained that you don’t need to attach them if you are using the mesh tent, they are only used when you want to use the fly alone with the poles and the (sold separately) footprint. 2) One of the short ridge poles had a metal sleeve slid over it, but there are two ridge poles so I initially thought that one was missing. But Nemo explained that this is actually a metal pole repair sleeve, so its not used during setup, and that is why there is only one. The setup also includes a repair kit. There are clever devices attached to the fly so that you can roll back the fly openings and keep the fly doors open for more air. I also liked that the guy wires are all reflective, so you don’t trip over them at night. I arrived at camp at about 11pm, so it was very dark. I was able to setup the tent in about 30 minutes using only my headlamp — the trial run before leaving helped. I went slow on purpose so I wouldn’t miss anything, but after setting this up twice, I don’t need to reference the setup instructions anymore and the time has been cut to about 15 minutes. The Jake’s feet devices make setup super easy, one person setup is totally possible. I purchased the footprint, which also attaches to the Jakes feet. Initially, I was a little worried about these devices because I read a review where the writer said he returned the tent after seeing the Jakes feet because he felt that if even a little amount of dirt or debris got into them they wouldnt work. This was not my experience — the campsite was compacted red clay and so it was very dusty and dirty, some dirt did get into the Jakes feet but the design is so open that it simply fell out with a little shake. And the benefit of these little feet are fantastic, easy snap in of the poles, the tent corners, and the footprint. Very clever. Tear down the first two times was about 30 min as well, but that’s mainly because I clean out the tent completely, and carefully fold everything. If I was in a hurry (i.e. if it was raining) I could tear down in 10 min easily. 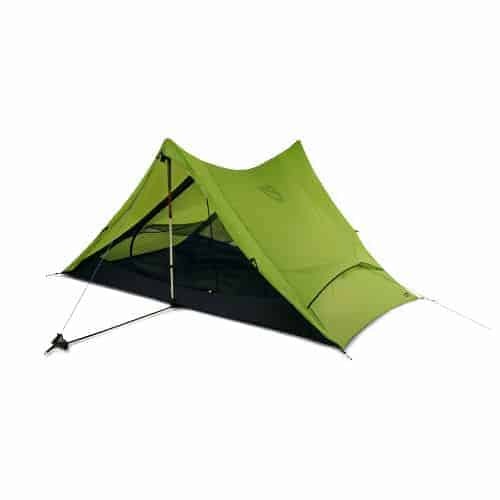 My favorite feature is the very light mesh and the fact that you can take off the fly and use just the mesh tent. On night two we decided to remove the fly because a boatload of bugs got caught between the mesh tent and the fly, by taking off the fly they were set free. We left it off and it was really cool to look up at the stars from our sleeping bags. Also, at dusk the mosquitoes got really bad so we sat inside the tent and played cards. At 6’1″ I was able to sit up very comfortably anywhere in the tent, including near the sides since the ridge pole design makes the walls almost vertical. There was at least 10 inches of clearance between my head and the tent top so I didn’t feel cramped at all. There is a small loop at the tent apex that we were able to hang an electric lantern from — helpful for the card playing. Also, the light diffusing pockets (there are two) on the included gear caddy did diffuse the light from a headlamp that I stuffed in enough so that reading was comfortable and the light was not too harsh. One of the pockets also fits a water bottle well. The only thing that I was not super impressed with was the very lightweight zippers that they used on the mesh tent. They seem a little flimsy, although I had no troubles opening or closing the tent. I did feel like I had to pull them gently though. But based on all the other positives of this tent, I am OK with handling the zippers with kid gloves, and I suppose the light zippers to help to keep the weight down. This two person tent by Nemo is probably not the best candidate for the fast-and-light crowd or thru-hiking, but for short treks and car camping this tent is great. 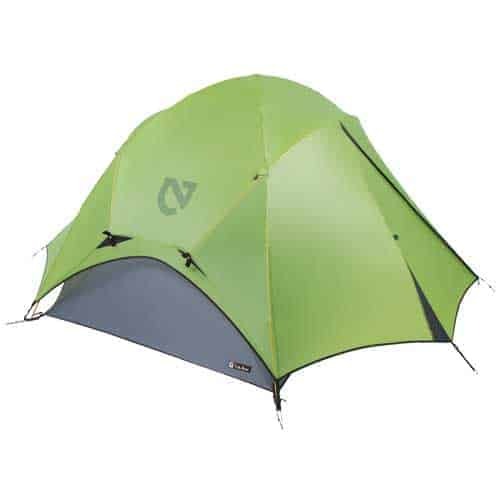 It weighs just under 5 pounds, rolls up a little bigger than a Ridge Rest, and packs more features per ounce than most any other tent on the market.The first time I set this tent up it was a little confusing. Of course I skipped reading the directions that happen to be sewn into its storage sack. The poles have an aluminum ball at the end that snap into plastic Jake’s Foot sockets at the corners of the tent. Very proprietary and unconventional, but at the same time smart and effective. The socket joints are articulated better than your standard strap and grommet pole attachment. The rain fly attaches to the Jakes Feet(?) with a buckle and causes them to pivot when the fly is tightened. Two long, lightweight aluminum poles come joined at the center with a rotating joint that clips onto a socket on the top of the tent. This is another convenient, easy, and innovative feature the engineers at Nemo Equipment threw in. A pair of shorter poles prop up the ceiling lengthwise. The nicest feature of all is the virtually vertical walls that this tent is able to achieve. It feels more spacious inside than a family size dome tent from a department store. All that extra headroom adds some comfort in the backcountry, especially if you’re caught in the rain for a day and stuck in the tent. 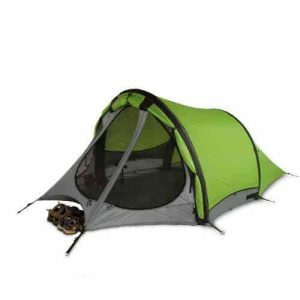 All in all the Nemo Losi 2P is an awesome tent for campers that like to travel in comfort. As soon as you unroll the storage sack, you are going to think, oh, I like this already. I know I did. Finally someone did something innovative about the traditional tent storage sacks. Nemo decided to create a roll-up sack, not unlike a roll-up climbing gear bag, with pockets for the poles, stakes, tent and fly. Unroll it and it keeps the parts out of the mud and sand.The setup of this tent may require instructions for the first time, but after one try, I had it down. The walls are nearly vertical, meaning at 6 foot 1, I was able to sit upright and read, without putting my head into the ceiling mesh. 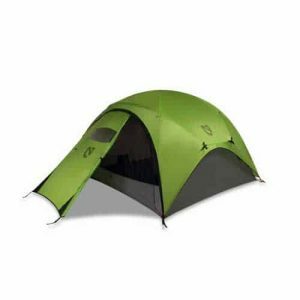 This tent includes two side-entry doors and vestibules, which helps to manage the traffic of hiking partners and gear in the tent. And don’t forget, Nemo is also producing some of the most innovative and comfortable sleeping pads and pillows for a good night’s sleep in the backcountry, at your favorite campground or even crashing on the floor. 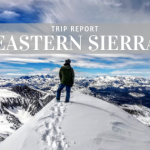 Check out the Nemo Astro Insulated pad for the ultimate in lightweight backcountry comfort (Backpacker Magazine’s Editor’s Choice for 2011! ), the Nemo Tuo self-inflating pad with separate over-under air chambers for fine-tuned comfort or the Nemo Fillo Luxury Backpacking Pillow for true backcountry luxury.